During the early phase of Mayan civilisation, Mayans didn’t have access to metals, so they made intricate and beautiful forms of jewellery out of the teeth and other bones of animals. Later, Mayans discovered not only metals such as gold and silver, they also found precious stones in the region they inhabited. So jewelry in the later period of the Mayan civilisation comprises of a vast range of mediums, including gold, jade, obsidian, bronze and silver. Mayans wore jewelry in the plugs they wore in lip and ear piercings, as well as to adorn their hair. The use of jewelry was limited to the Mayan nobility while the commoners were forbidden from using it. During the early period of the Mayan civilisation, Mayans didn’t have access to precious metals such as gold or to precious materials such as jade. So during this period, Mayans mostly made jewelry from items that they obtained from animals, such as their teeth and bone. Since jaguars carried a lot of significance in Mayan mythology, jaguar teeth were one of the most preferred items for making jewelry during this period. Others items commonly used were claws, shells, even well-crafted stones and feathers. As Mayan civilisation developed and prospered, it was able to discover metals such as gold, silver and copper in the areas surrounding Mayan settlements. These became the key ingredients of Mayan jewelry following their discovery. Mayans also discovered many other items such as jade and obsidian. After the discovery of jade, it became the most highly valued material used in making jewelry. Jade was also exported by Mayans to other non-Mayan cities as a valuable part of trade. One of the most common, and sought after, materials of jewelry in the Mayan society was jade. One of the most common, and sought after, materials of jewelry in the Mayan society was jade. Jade was treasured not only because it was a precious stone but also because Mayans associated a lot of religious significance to it. To Mayans, jade was related to the deities and the notion of eternity. Consequently, Mayans produced many different types of jewelry using jade as the main component. This included ear plugs, bracelets, rings and headdresses made of jade. The specific type of jade found in the Mayan lands was Jadeite. This particular form of jade is incredibly hard and is very difficult to work on. It is possible that Mayans valued jade jewelry so much because of the sheer amount of labour that had to be expended in making it. Given its toughness, artists had to spend a lot of time in trimming down raw jade stones and turning them into pieces of jewelry. Since most ancient cultures treasured art objects based on the amount of labour they required, it is understandable that the labour-intensive nature of jade jewelry made it one of the most valued items in tMayan society. Generally, jade jewelry was manufactured so that it used designs of animals and religious symbols from Mayan mythology. Mayan jewelry served as an important ingredient in the social stratification of Mayan society. Typically, the craftsmen of the jewelry were commoners who laboured on it and crafted it to perfection. Although craftsmen hailed from the commoner class, they were esteemed one station above the other commoners. So they were better off than the other commoners. However, even the craftsmen were forbidden from making use of the jewelry, because wearing jewelry was seen as a social privilege and honour. Jewelry was limited to the nobility class who wore jewelry as a display of their high social standing. As a rule, the higher a person’s social status was in Mayan society, the more precious was the jewelry he wore. Mayans created many different kinds of jewelry items which they would wear as public displays of power and privilege. Some jewelry items were also used as symbols of Mayan religious concepts. Most commonly, Mayan jewelry was created in the form of pendants, necklaces, rings and ear plugs. Of these, ear plugs were the most common way of wearing jewelry. Mayans wore huge and heavy ear plugs, so much so that they tended to extend the earlobe to extraordinary lengths. Mayans also used jewelry in nose and lip plugs. Of these, nose plugs were common among men of high standing while lip plugs were used by Mayan women. Mayans also used jewelry in their headdresses as a means to show off their superior status. Precious materials such as jade were used in headdresses only by royalty. Domestically, Mayan jewelry was used only by the nobility. It was also considered as art and was traded to other Mayan and non-Mayan cities. Among the most common jewelry traded by the Mayans was jade jewelry. Since jade was predominantly found in Mayan lands, Mayans would trade it to other non-Mayan cultures in return for products they needed. As a rule, jade was considered a highly valuable item in other cultures where it was worn by the nobility and royalty. 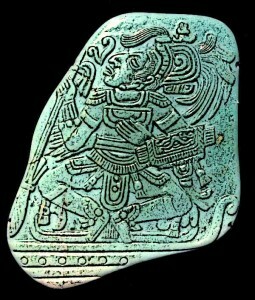 Mayan rulers gifted jade jewelry to their contemporaries in other cities, as a token of honour. Jade was also used as a currency in trading and offerings to the gods, one of the most precious tributes. In some cases, religious priests used jade jewelry as a means of healing the sick and it was also used in many religious rituals. Mayans used a number of materials to manufacture exquisite forms of jewelry. Jade was the most popular material used in making jewelry in later Mayan civilisations. Given its hardness and the sheer amount of labour required to bring it into shape, jade was highly treasured and its use was limited to the nobility in Mayan society. Mayans also made jewelry from gold, silver, bronze and copper. Jewelry was considered a vital part of the Mayans trade with non-Mayan cultures. It served as a currency and as a profitable item of export. Mayan rulers frequently gifted valuable jewelry, such as that made of jade, to their fellow rulers in other cities.